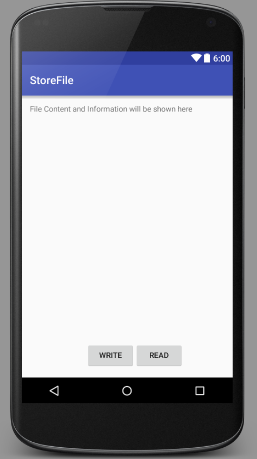 Hello Friends, Today I am writing this post to share that how to read and write file to external storage in Android. In the latest version of android Marshmallow, we cannot read and write file directly in external storage even we declare permission in manifest file but in lower version we can use external storage after declaring permission in manifest file. To access external storage in Marshmallow we need to take permission at runtime. From the code below we can read & write file to external storage on any android version. android:text="File Content and Information will be shown here"